Probably the longest bar in Scotland. Any sport that’s on TV, you’ll find it here and see it for free on our 6 giant LCD screens and Giant Projector. Football, golf or snooker – we’ve got it covered. Or you can relax outside in our beer garden and still enjoy the service and style of Inside Out – the perfect place to chill out! For more info please call 01698 333 777 and select option 4. Inside Out Bar has its own beer garden where you can relax with the family, have a pint and even order some food! The brand new Family Restaurant is a warm and friendly environment for the whole family. Check out the fantastic new menu with loads of delicious new dishes to enjoy. To view the Family Restaurant menu, please click here. To find out more about Food Allergies, please click here. For more information please call 01698 333 777 and select option 4. Our ingredients have been sourced to provide great quality and taste, which includes local farmed eggs and Morton’s Rolls. We only use items containing 100% meat and we use a local butcher for all our sausages, mince and meat specials. The butcher we use has won gold awards for their Scotch pies and sausage rolls, highlighting the quality of their meats. We appreciate all our customers and have recently created different menu items to allow us to cater for everyone. All our chicken items are Halal. We are now listed on the Coeliac UK website as a venue offering both gluten and wheat free foods. In addition to all of this we offer a selection of Crolla’s ice cream, Italian coffee made with Arabica beans and delicious cakes. 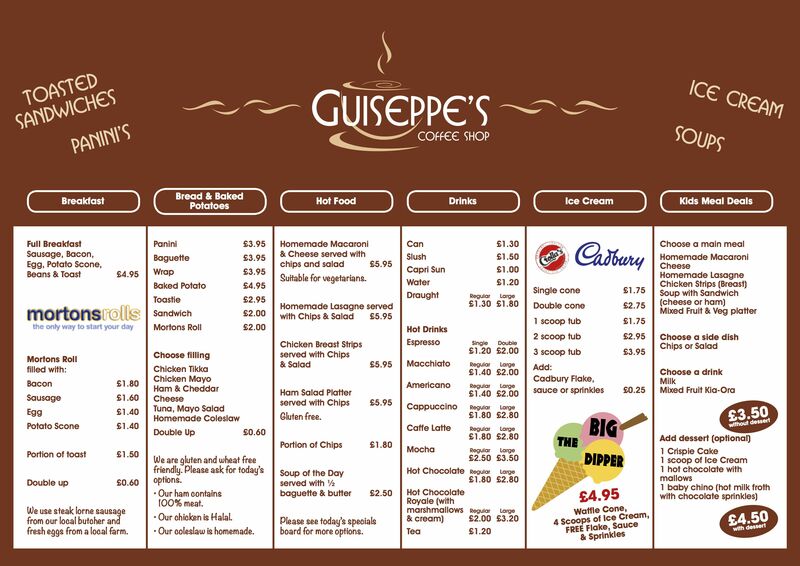 To view the Guiseppe’s Coffee Shop menu, please click here. 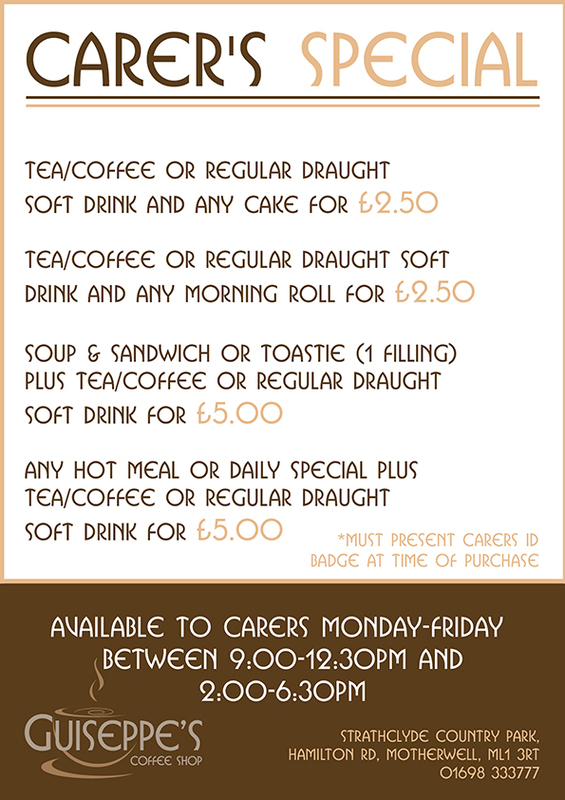 We also have some special offers for carers; please click here to view the Carers Special Offers. For more information, please call 01698 333 777. At Mario & Dino’s Pizzeria, you will eat one of Italy’s most famous dishes – pizza. We offer delicious Italian pizzas made only using the finest ingredients, so whether you are looking for a quick bite or to feed a family of four – Mario & Dino’s will throw you a pizza with no bother! 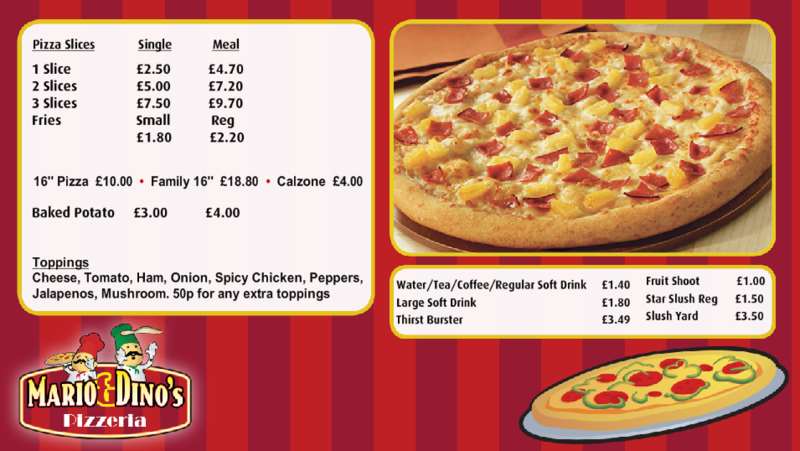 Choose from a delicious selection of pizza slices or create your own 16″ pizza with our scrummy toppings. We also serve fantastic Calzones (a pizza that is folded in half!) and hot fluffy baked potatoes too! Any why not finish your meal off with a cookie or two?! All our meals include fries and a choice of drink. To view the Mario & Dino’s Pizzeria menu, please click here. Seating – Indoor & Outdoor. Available 7 days, prices vary depending on party size. All requirements catered for: including a buffet selection, DJ, karaoke and bowling. Contact us to find out the best deals we can offer at Cosmic Bowl. Come along and speak to a member of our staff for a guided tour – for more information please call 01698 333 777 and select option 4.